In November of 2017, we flew down to Vegas to attend the annual MJBizCon. The evening before the convention, we met the owners of ASHCo at an event, and continued to run into them at other events the next 3 days. By the end of the weekend, we had all agreed that these meetings were too serendipitous to ignore and began a working relationship that continues to this day. Hemp has been an integral part of American society since the founding of our great nation. The Declaration of Independence was penned on hemp paper and Franklin, Jefferson & Washington consumed, cultivated and held the truth about the benefits of hemp to be self-evident. Today, hemp is used for traditional textiles and processed to extract CBD for product manufacture. American Standard Hemp Co. was founded to honor those traditions while boldly crafting a better future for hemp. With this ethos in mind we set out to craft an identity that had a working-class, rustic feel to it. "Embracing Tradition for a better future"
We often use wordplay to help us ideate when creating branding. 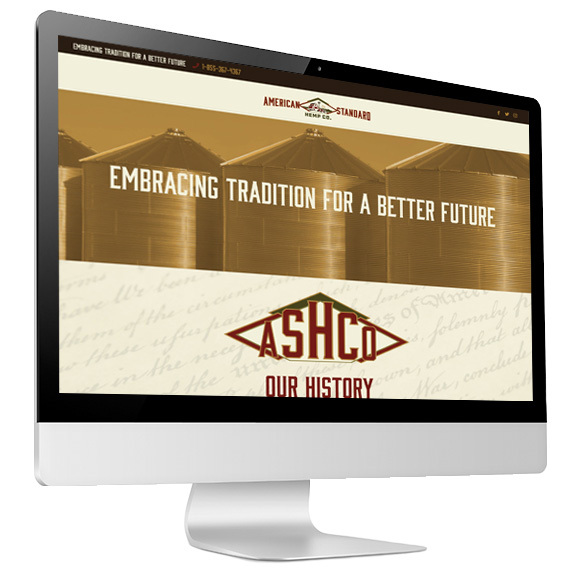 With the ASHCo brand we created a tagline that embodied their roots in the tradition of American hemp farming. Once the branding was approved, we set out to build their landing page. Design-wise, we wanted to carry the color palette through the site, and use elements that evoke a rich history of hemp in America, while showing that they are a forward-thinking, science-based company.